Winneshiek Idea House | Winneshiek County Development, Inc.
What is Winneshiek Idea House? Winneshiek Idea House is a space for local entrepreneurs to share their needs with a supportive community and crowdfunding happens in real time. The event takes place in Decorah, Iowa and is of service to those who call Winneshiek County home. At Winneshiek Idea House, everyone is an “investor.” We are investing in the resilience and sustainability of our local economy and community. We’re showing entrepreneurs that we value the equitable, sustainable business ideas that keep communities vibrant for years to come. The inaugural Winneshiek Idea House raised over $7,000 for local entrepreneurs. Enthusiastic attendees offered support ranging from child care to marketing consulting. Other gifts included social media support, copywriting, bookkeeping, photography, and more. This project is a project of Winneshiek County Development, Inc. and supported by the Iowa Small Business Development Center for the purpose of incubating sustainable enterprises, encouraging business people of all ages, and making Winneshiek County an even better place to live. 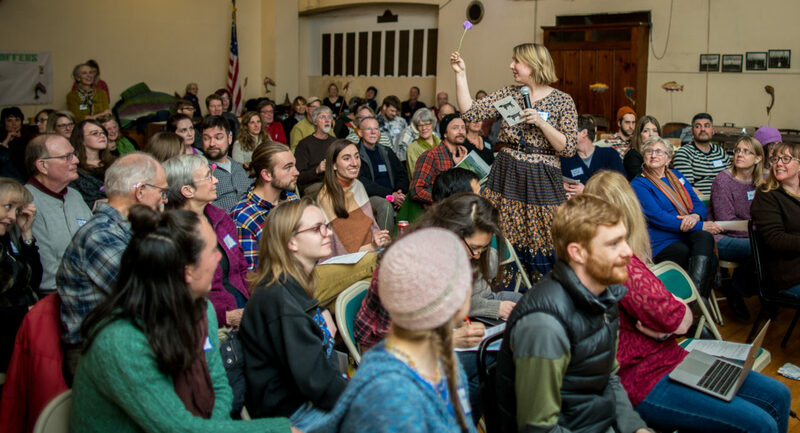 On February 23, 100+ “investors,” entrepreneurs, and community leaders gathered at the Decorah Elks Lodge for the second annual Winneshiek Idea House and Trout Tank. Read about the event and watch the video below to learn more. View the photo gallery from Winneshiek Idea House 2019. Photos by local photographer Brittany Todd. Winneshiek Idea House is derived from the Local Entrepreneur Forum concept created in Totnes, UK. The REconomy Centre in Totnes hosts these events annually and has supported over two dozen enterprises. Interested in running a Local Entrepreneur Forum in your community? Check out this resource. If you have questions or would like to get involved, please contact Tabita Green (563-387-7663), Liz Rog (563-382-8013), or Kristin Eggen (608-306-1246), or use the form below.